Rapid recovery rhinoplasty is a type of nose surgery in which the surgeon takes special precautions to speed up the recovery period. This may include making small incisions, avoiding nasal packing, and using special tissue glues and dissolvable sutures. To speed healing, surgeons will also recommend that patient’s follow certain post-operative instructions and recommend complementary therapies that may help promote the healing process. The techniques utilized in rapid recovery rhinoplasty limit the amount of swelling and bruising that occurs during and after surgery, dramatically decreasing the recovery period after surgery. The typical bruising pattern around the eyes that is associated with traditional rhinoplasty is not common with rapid recovery rhinoplasty. With rapid recovery rhinoplasty, most patients look presentable within one week of their surgery and feel comfortable appearing in public, whereas the initial recovery period associated with traditional rhinoplasty is usually two weeks. If a nasal splint has been used to provide additional support, it will be removed one week after surgery. Patients are able to resume moderate exercise after two weeks and can resume more intense sports after six weeks. To promote a rapid recovery following rhinoplasty, surgeons may use a variety of techniques that are known to decrease the likelihood of bruising, swelling and pain, while promoting healing. 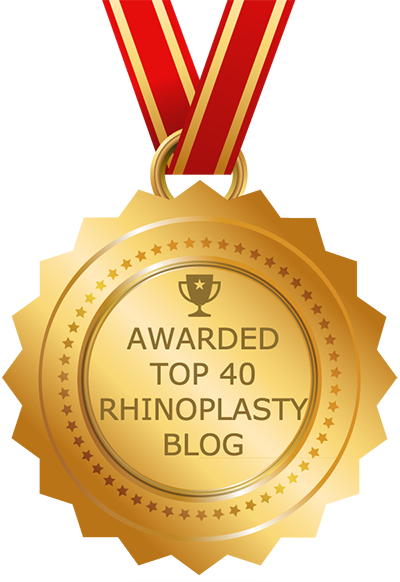 A key component to rapid recovery rhinoplasty is the use of 3D high definition imaging. This technique involves the use of a specialized endoscopic telescope that produces a 3D high definition image, which provides the surgeon with a detailed view inside of the nose. This image allows the surgeon to better plan the surgery and operate with more precision. Guided by the telescope, the surgeon is able to avoid blood vessels and soft tissue, which can be easily damaged during rhinoplasty, contributing to post-operative bruising, swelling, and pain. Some surgeons use dissolvable sutures to close both internal and external incisions in rapid recovery rhinoplasty. They believe this promotes rapid healing and reduces the risk of an infection. When dissolvable sutures are used within the nose they will dissolve and disappear within a few weeks, eliminating the need for the surgeon to remove the sutures at a later date. Rather than using nasal packing, which can increase post-operative swelling and cause a great deal of discomfort, some plastic surgeons choose instead to use tissue glues to seal small blood vessels and support the nose as it heals. Tissue sealants can help prevent the formation of scar tissue under the nasal skin, which can lead to an undesirable result. Another technique used in rapid recovery rhinoplasty is smaller, more precise incisions that are not closed completely. The use of 3D high definition imaging allows surgeons to make smaller incisions, which decrease bleeding and swelling. In some cases, rather than completely closing the incisions inside the nose, the surgeon may leave part of the incision open to allow fluid to drain from between the incisions. This speeds recovery and eliminates the need for nasal drains, which can be uncomfortable and further prolong the recovery. In addition to surgical techniques, surgeons who provide rapid recovery rhinoplasty may also encourage their patients to do certain things before and after rhinoplasty to encourage and promote rapid healing. Apply ice packs to the lower eye area at frequent intervals for two days following the rhinoplasty. Icing is one of the best ways to reduce post-operative swelling and bruising. Keep the head elevated for at least two weeks to encourage swelling to subside more quickly. At night, use two pillows to ensure head remains elevated. Use a saline spray for six weeks to keep the nasal passage moist to support healing. Apply an antibiotic ointment to the inside of the nose. Take vitamin C for two weeks following surgery to encourage healing and decrease swelling. Undergo lymphatic massage to encourage reduce excess fluids in the body and encourage healing. Avoid alcohol and tobacco for several days or weeks following surgery. Continue to avoid aspirin containing medications and herbal supplements such as St. John’s Wort, gingko biloba and echinacea.